The best and most unique sights of Southern Australia are just waiting for you to uncover them! 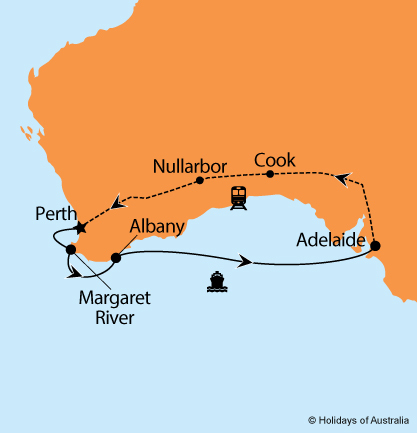 5 nights aboard Sea Princess cruising from Fremantle to Adelaide with port calls in Margaret River (Busselton) and Albany. Your cruise includes onboard meals and entertainment. Transfer from the cruise terminal to your accommodation with Half day Adelaide City Sights tour with lunch. 4 night stay in Adelaide at Hilton Adelaide including breakfast. Morning Adelaide Central Market tour. Full day Barossa Valley & Hahndorf Highlights tour. Overnight Kangaroo Island tour with return ferry. Transfer from your accommodation to Adelaide Parklands Terminal for dinner. 2 nights aboard Indian Pacific from Adelaide to Perth in Gold or Platinum Service. Your journey includes all meals, drinks and off train experiences in Cook and Nullarbor. Images courtesy of Tourism WA, Princess Cruises, SA Tourism & GSR. ^Save $100 per person offer is available on new bookings only and has been applied to the advertised price. $1000 reduced deposit is per person twin share, single deposit is $2000 and do not include the cost of flights, which will be additional if applicable. Valid on bookings made & deposited by 31 Mar 2019. Travel insurance voucher must be used within 7 days of booking, is valid only when booked with Holidays of Australia & the World and is not redeemable for cash or any further discounts.